Raja Ampat Homestay Survey: How was your stay? Tell all here. The Asosiasi Usaha Homestay Lokal of Kabupaten Raja Ampat (the Raja Ampat Local Homestay Business Association) is committed to making your stay as enjoyable and rewarding as possible and would really appreciate your feedback. If you’ve stayed at a homestay, travelled with a local guide or spent time on a liveaboard or at a resort, please take a few moments to respond to the Raja Ampat Homestay survey. 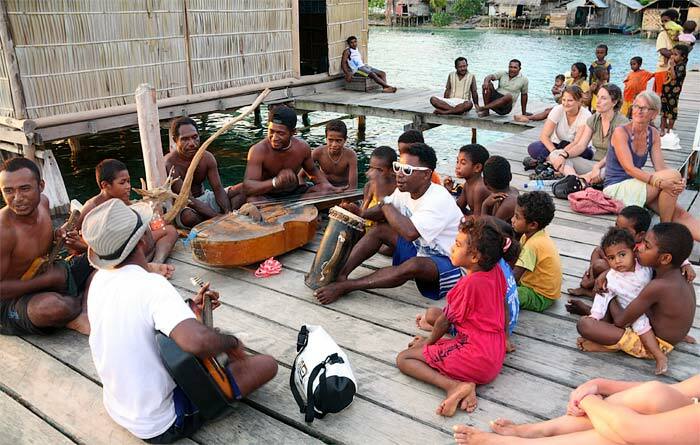 Sharing your experience, impressions and suggestions will help Papuan homestay owners, diving and tour guides improve the services and facilities they offer their guests and will contribute to the success of an initiative designed to provide sustainable incomes for people living in the Raja Ampat Marine Protected Areas. The fledgling community eco-tourism industry in Raja Ampat is the foundation of the plan to protect the marine environment of the Bird’s Head Seascape – your input is sought to help make it as good as it can be. Anonymised and aggregated survey data is also supplied to the Raja Ampat regency government to help them understand what’s truly important to visitors to the islands so they can formulate appropriate planning policy. Your input really can make a difference! The survey should only take around ten minutes to complete. It was developed on behalf of the Raja Ampat Homestay Association with assistance from Seventy Three Pte Ltd, and was funded by the Walton Foundation Parallel Initiative for the Bird’s Head Seascape Marine Protected Area. If you have any questions about the survey, the Parallel Initiative project or about the Homestay Association, please feel free to contact the survey’s publishers. Stay Raja Ampat also welcomes feedback, comments and updates to the information published on this website – if you’re interested in contributing, please refer to this page for details. My greatest concern is tourism growing the way it is. Many tourists cannot swim and are being brought to places with changing tides to snorkel. Reefs are being kicked and killed. You can see it in many places. When reefs are gone, so to are the fish, then the tourism, and then the entire purpose of the promotion of homestays for tourism. I’ve been to a few sites that look like coral graveyards. The good thing is I can also see new growth. The growth occurs slow though, and tourism is expanding fast. I hope the 1,000,000 IDR we pay is being utilized appropriately. My fear is that the beauty I have seen will soon deminish as it has is many other areas of the world. Tourism will override eco preservation. Garbage will grow etc etc. Maybe before tourism is expanded a waste system should be placed? Not for the tourists garbage but also the villages and homestays. More people, more boat trips for food, more waste, more garbage in the oceans. I love the area but am disgusted with all the rubbish that is floating in the water and is kept around the homestays. If this problem is not solved I do not see a future for Raja Ampat. The villagwrs need help from the government. As tourists pay 500000IDR each there should be money to solve this problem with a rubbish unit in Sorong and a boat that regularly picks up rubbish from the different islands. We agree about the rubbish and what it will mean for Raja Ampat if the problem isn’t addressed. Villagers and homestay owners do what they can, but – as in most other places in Indonesia – it’s difficult when there’s no effective regional waste management system in place. It’s doubly sad in Raja Ampat because the majority of rubbish there isn’t being generated by the villagers themselves. The monies raised by the Marine Park entrance tag PIN scheme are earmarked for marine park management, patrols and community development funds and unfortunately don’t currently raise anywhere near enough to fund the kind of infrastructure needed to solve the problem. Hopefully that’ll change as visitor numbers grow and the fee is doubled in 2015. Maybe the money of the entry fees vanishes in wrong projects like the cathedral-like arriving building in Waisai harbour? Nope. Things like that, the airport and all the Waisai beachfront beautifications are funded by national government money given to the regency for schools, hospitals, waste treatment facilities and other essential public services. This is where the entry fee money goes. We found the trash situation also to be the biggest issue with the Raja Ampat region and also as a mater of fact the whole of Indonesia for the several destinations we have visited including Bali. There needs to be a serious education program for the people of Indonesia beginning with the children in schools as the parents already have the bad habit of using the ocean as a trash can. Raja Ampat can be a case study as the people live off the resource of the ocean environment. The trash situation is truly truly very bad and will keep tourists from returning to the area, thus costing a lot more in revenue to the people of Raja Ampat than the cost of education and collection of trash. Your generalisation has some truth to it, and programs are in place to address littering, but by far the larger problem is that there are no effective waste management facilities in much of Indonesia. Putting rubbish in bins has no effect when those bins are emptied into insecure landfill. Hopefully all visitors to Raja Ampat who are concerned about the trash problem do their bit by taking all their non-biodegradeable waste home with them. Forgive me for being argumentative but I have a genuine concern and interest but not a clear understanding of the issues of the region. That being said, The trash I see floating in the water and washing up on shore with the tide is not from travelers visiting the area. I see lot’s of plastic that is not biodegradable like 2 stroke oil containers for mixing with outboard motors. Yougurt containers, water bottles etc. Why couldn’t there be a program where each home stay in the area has a barrel stenciled for beach trash and they could burn it on occasion rather than let it wash away to the next beach on the next high tide? It could also show the travelers that there is an effort in place to mitigate the issue and show concern for the environment. I know that if there was such a container in Mambassar I would have picked up a handful of trash on my walks to do my part just like I do at home in San Diego. Enough said that is my 2 cents worth. No, no – that’s not argumentative Terry – it’s a fair point. Most homestays are doing all they can to keep their environment clean and there are homestay organised trash collections from beaches in the islands – hence the piles of trash often seen behind homestays: They still face the problem of what to do with the trash once they’ve collected it. A lot of it is burnt, but that’s not an ideal solution – especially not for plastics. It’s certainly true that most of the trash to be found in the ocean and on beaches in the islands isn’t generated by tourists, but neither is the bulk of it generated in the island communities themselves. This article has more about the sources of trash. Regardless of sources though, we share your concern. It’s certainly safe to say that everyone agrees that the issue is a growing problem and needs to be addressed! Sounds like there is plenty of concern and effort to address the issue. The Marine Park administration is the first to do not attempt to the “If you bring it in (or create it), take it out!” sentence… I wonder indeed why deliver the gadgets, like the bottle, inside a plastic bag. I guess you could try to banish somehow plastic packaging from the Islands, at least try. I do not agree to your comment! I’m just now staying in Raja Ampat and what I see every day, is that local people throw away their empty bottles, mostly over board, while tourists collect bottles and other rubbish laying at the beach on their way and look for a place to put it. You can also see a lot of rubbish behind almost every homestay and even a lot more in the villages. And don’t look a few meters out of the village, there it is even worse! It would be very helpful, if the government could help.